The Canadian Opera Company’s first ever production of Handel’s Ariodante proves to be a praiseworthy event. 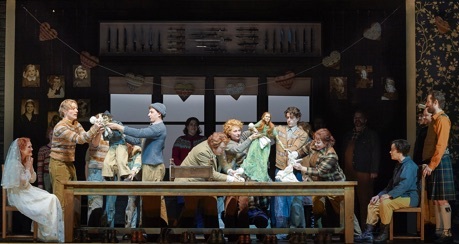 A co-production with Féstival d’Aix-en-Provence, where it premiered in 2014, Dutch National Opera and Lyric Opera of Chicago, Richard Jones’s direction generally enhances the work, one of the most dramatically and psychologically realistic of Handel’s opere serie. Anchored by Canadian soprano Jane Archibald, making her role debut as Ginevra, the opera is musically and dramatically gripping throughout. Ariodante derives its plot from Cantos 5 and 6 of Ludovico Ariosto’s epic poem Orlando Furioso (1532), the action set during in the reign of Charlemagne (800-814ad). The story involving Ariodante takes place in Scotland, where Ginevra, daughter of the King, is happily betrothed to Ariodante. When Ginevra rejects the lewd advances of Polinesso, the Duke of Albany, Polinesso with the help of Ginevra’s maid Dalinda, tricks Ariodante and his brother Lurcanio into believing that Ginevra has been unfaithful. As a result Ariodante attempts suicide and Ginevra is condemned to death. Fortunately, Dalinda, realizing how she has put Ginevra’s life in danger, confesses the truth and all ends happily. Jones and his designer Ultz have done away with all the trappings of heroism and chivalric romance and relocated the action from medieval Scotland to a small Protestant Scottish fishing village in the 1970s, not unlike that in Lars von Trier’s 1996 film Breaking the Waves which also deals with a woman shunned by society for wantonness. The “Re di Scozia” of the original is now simply the laird of the village and Ginevra is no longer a princess but simply his daughter. Jones’s biggest change is to make Polinesso, whose love Ginevra spurns, no longer a duke but the local preacher who leads prayer meetings in the laird’s house. Unfortunately, Jones and Ultz go too far in making him a villain. Under his cassock Polinesso sports denim, tattoos and a studded wristband; he beats and degrades Dalinda when she is disguised at Ginevra; and he periodically erupts in “evil” laughter as if in a melodrama. Otherwise, Jones’s emphasis on the strict religious background of the village helps make sense of the entire community’s shunning of Ginevra when it believes she has become sexually promiscuous. Since Handel had available the services of dancer Marie Sallé and her company for this opera and for Alcina (1735), these are the only two operas by Handel that contain ballet interludes at the end of each act. At the end of Acts 1 and 3, Jones included some traditional Scottish dancing, but this soon gives way to puppet plays well executed in the style of of tabletop bunraku. The first interlude is presented as the villagers’ wedding gift to Ariodante and Ginevra depicting the lovers’ courtship and a providing a humorous glimpse of their married life with children. The second, staged to shame Ginevra, casts her as a prostitute and, going too far, even portrays her pole dancing. The third is a repeat of the first. Jones does change the ending to accord more with modern sensibilities. This Ginevra does not accept the main characters’ apologies for mistreating her and finds grating the notion that everything can now return to normal. She therefore escapes her father’s house, suitcase in hand, during the final celebratory music. Ultz’s set presents us with the laird’s house sliced in half showing us three inside rooms and a outdoor landing. The only non-realistic aspect of the design is that there are no interior walls and the connecting doors are indicated only by a block with a doorknob and lock on a metal pole attached to a hinge. This scheme allows Jones to stage two events occurring in the house at once, one often in ironic relation to the other. In terms of acting, Jones draws finely detailed performances from the cast with two notable exceptions. One is Polinesso, whom he treats unnecessarily as a caricature rather than a spurned lover driven to extremes. The other is the chorus to whom he gives stylized, synchronized movements, making them line up and walk about in formation as if they were automatons. Doubtless this is meant to emphasize the community’s solidarity, but it clashes needlessly with the realistic portrayals of the principals. The unequivocal star of the evening is Jane Archibald. Her bright coloratura, her immaculate technique and her impressive acting skills make Ginevra the very heart of the opera. The ease with which Archibald tosses off the innumerable roulades, trills and high notes of the joyful “Volate, amori” of Act I is simply spectacular, while the change of tone and profound emotion of the reflective “Il mio crudel martoro” of Act II is extraordinarily moving. Musically and dramatically Archibald’s Ginevra is an immediately sympathetic character, a spirited young woman who realizes to her horror how quickly a lie can turn her father, her lover and her whole community against her. piace al cor” in which she expresses a battered woman’s hope that Polinesso's cruelty may eventually lead to tenderness. The other is Dalinda’s great aria of anger and repentance “Neghittosi or voi che fate?” where Braid’s superb vocal control only heightens the aria’s emotions. Jones may have Abrahamyan play Polinesso as a caricature, but Abrahamyan’s singing shows that Handel has written the character as a much more tortured figure. Abrahamyan’s remarkably agile voice maintains its dark richness throughout its entire range, not even losing its quality in the course of complex runs. Compared with Archibald, Braid and Abrahamyan, Alice Coote’s vocal production as Ariodante was less consistent. Coote’s mezzo-soprano is lighter in tone than Abrahamyan’s but just as agile. Strangely, however, during the rapid passagework Handel has lavished on her character, Coote’s voice takes on a matteness or even becomes inaudible. During Ariodante’s fantastic aria of celebration “Dopo notte, atra e funesta”, Coote shouted her four repeated high staccato notes as if the passagework had left her out of breath. In contrast to this, Coote’s greatest triumph was Ariodante’s great aria of despair, “Scherza infida” where she beautifully negotiates its slow legato passages and movingly conveys its strong emotion. As the King of Scotland, Johannes Weisser is not as able to imbue his singing with as much feeling as the other principals. Tenor Owen McCausland is excellent at conveying Lurcanio’s impetuosity though his top notes are not always as secure as they should be. COC Music Director Johannes Debus conducts Ariodante, his first ever Handel opera, with elegance and panache. His well chosen tempi and sprung rhythms create the effect of a period band as much as modern instruments allow. With its emphasis on ordinary people with realistically portrayed emotions rather than on the rage and enchantments of knights and sorcerers, Ariodante is one of Handel’s most accessible operas. Overall, this production is a happy occasion when a director’s reimagining of an 18th-century opera was well received by the audience, likely because Jones’s emphasis of the work’s depiction of male-dominated society’s inherent bias against women is still so relevant today. Note: This is a version of the review that will appear later this year in Opera News. Photos: (from top) Jane Archibald as Ginevra (on bed) with Alice Coote as Ariodante and Johannes Weisser as the King of Scotland; Act 1 puppet play in Ariodante; Varduhi Abrahamyan as Polinesso and Ambur Braid as Dalinda (in background). ©2016 Michael Cooper.